We are all conditioned. We are led to believe through our social expectations that we deserve results – and that we are entitled to those results NOW! In a world of disposable culture and instant gratification, nothing is ever more than a few clicks away… In our “everyday” of convenience and “fast” – be it food, or lifestyle – we have never been tantalisingly closer to whatever it is that we desire. The world is getting smaller and our lives – generally – are only getting faster! We need to shift the focus from convenience, to commitment. “When you’re interested in something, you do it only when it’s convenient. When you’re committed to something, you accept no excuses; only results.” Kenneth Blanchard. A farmer once planted two seeds – corn and bamboo – and carefully nurtured and cultivated them. The following year, one of the seeds had become a corn stalk, but there was no sign of the bamboo… This continues for years – the corn stalk eventually delivers an extensive cornfield, but the bamboo… nothing. And then, “all of sudden,” 20-foot bamboo shoots tower majestically over the cornfield. Years of no return, and then, an apparent explosion of growth. How was the bamboo able to grow so fast, and so strong? 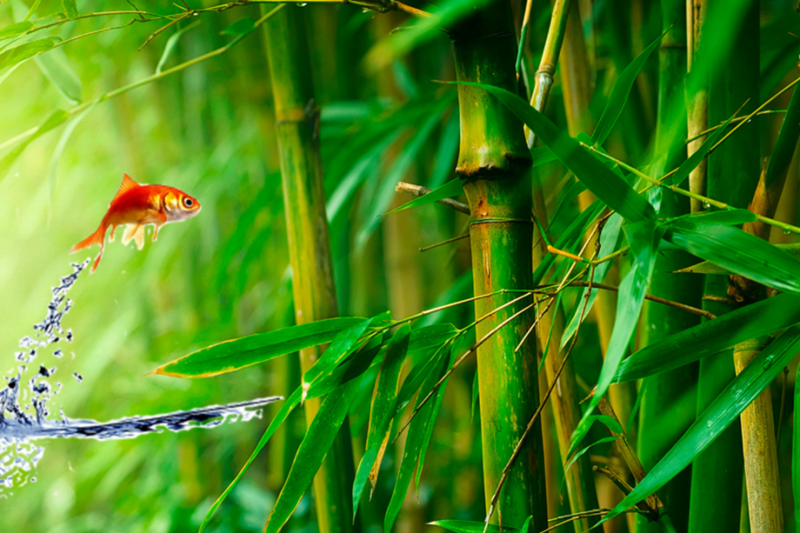 For all those years, the bamboo was developing its roots. It was laying the foundation for huge, sustainable growth in its life. Some people are more like the corn seeds – you offer them a taste of growth, and they sprout. But when people grow really quickly, and have “rapid” success, they generally don’t tend to possess the foundation to sustain their growth. The first wind spells disaster. Their old habits and paradigms soon return. Like the bamboo, you are growing, developing, and learning. You are building your “roots” – your foundation for the day that you too will tower over the field – the day that you will tower over your own doubts and insecurities. As Jim Rohn says, “There are two ways to have the tallest building in the city. One is to build yours the tallest. The other is to tear down all of the other buildings…” Build yours the tallest – pay no heed to those that wish to tear you down, or who have no understanding of building and nurturing a foundation. “Everybody is a genius. But if you judge a fish by its ability to climb a tree, it will live its whole life believing that it is stupid.” Albert Einstein. In the year 2000 – the year in which Ericsson Mobile communications released the first device marketed as a “smartphone” – the average human attention span was believed to be around twelve seconds. In 2013, a Canadian study suggested that the average attention span had drastically reduced to a mere eight seconds – one second less than what is believed to be the attention span of the much-maligned goldfish! Coincidence? Or is digital dependence “re-wiring” our brains and irrevocably eroding our ever-diminishing levels of attention? A recent survey of 30 000 pupils revealed that self-esteem of teenage girls – particularly 14-15 year olds – has significantly dropped since the boom of social media and online communication. Figures show that many of today’s teenagers struggle due to a variety of factors including schoolwork, looks, peer pressure and weight. Stop comparing yourself to others. It really is that simple! As Eleanor Roosevelt said, “comparison is the thief of joy”. The problem with comparing your perception of yourself to others, is that you have no idea of their “story”. You formulate an opinion – embellished by your values and beliefs – and you make a subconscious judgement about them, when you haven’t the faintest idea of what their personal journey is all about. “Don’t compare yourself with anyone in this world… if you do so, you are insulting yourself.” Bill Gates. “There is nothing noble in being superior to your fellow man; true nobility is being superior to your former self.” Ernest Hemingway. Previous Previous post: Is Stress Good For You?